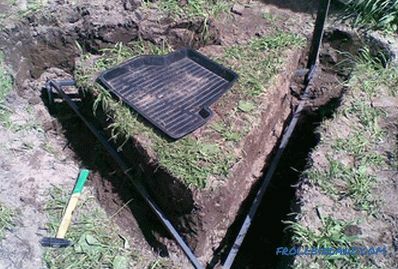 Each type of lining has its own characteristics and requirements for surface preparation. In this article, attention will be paid to the quality of the wall and the types of lining materials. The formation around the wall of a protective ventilated screen that allows the walls to breathe. Vinyl siding does not require special care: to keep the facade clean, it is enough to wash it with water sometimes. PVC does not burn. Although it melts, releasing harmful substances, it does not exacerbate the situation of people in a fire inside the house. A house trimmed with vinyl siding looks very modern, without losing its aesthetic properties for many years. 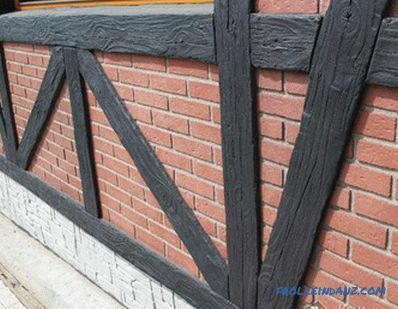 Anti-fading and durability depend on the manufacturer. Pleasantly low prices can be deceptive. Poor house trim will last only a few years, and then it will have to be changed, which would entail additional cash costs. 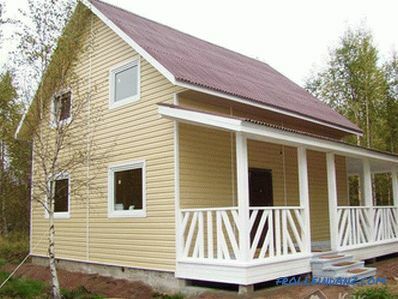 Measure the house before buying the material for finishing the facade . 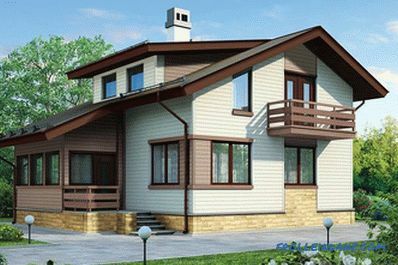 This will allow you to calculate the number of siding and additional elements for its installation. 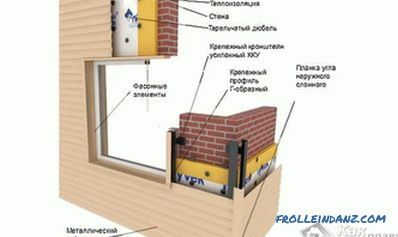 It is very important to comply with the installation technology. Calculate the expansion and contraction ratio of vinyl siding. This event will help you to avoid rework due to the expansion of the material in the hot season. 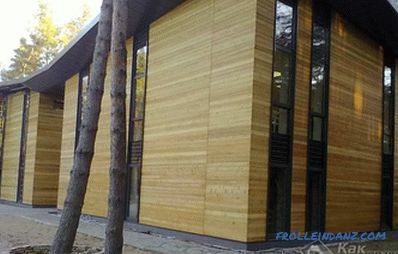 Not less common material for cladding is natural wood siding. Well, this structure looks really great. 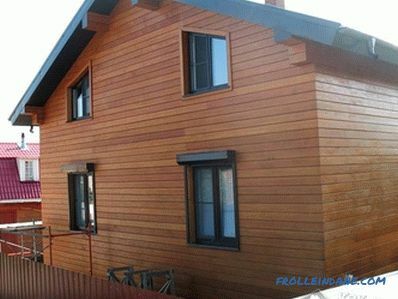 However, wood is relatively short-lived, so the costly magnificence of wooden siding may be unjustified. 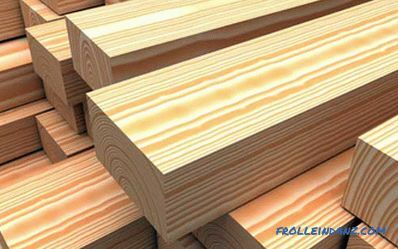 However, modern technologies have provided an opportunity for manufacturers to produce wooden siding with an extended operating period. 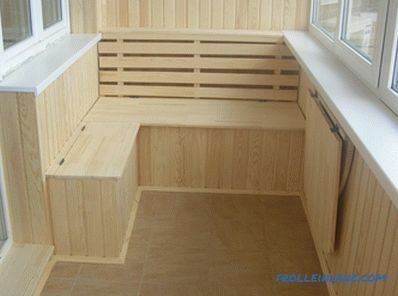 With the help of high pressure treatment, the density of the wood is increased. This increases the resistance of the material to the effects of aggressive environment. The most durable, unpretentious, fire-resistant and resistant to mechanical damage is considered to be metal siding. 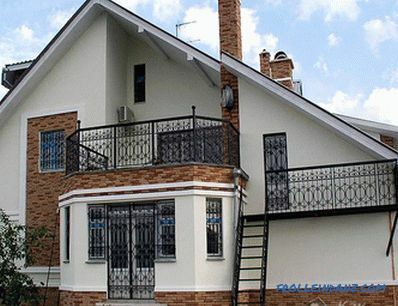 It is made of galvanized polymer coating. The main drawback of the material is a limited palette of colors and types of textures. The grounding device corrects the conductive properties of the metal. This event, by the way, prevents the penetration of radio-magnetic waves into the building. In this case, the house will have a protective screen, but the mobile connection in it will be bad to catch. The plastered facade is also called wet. 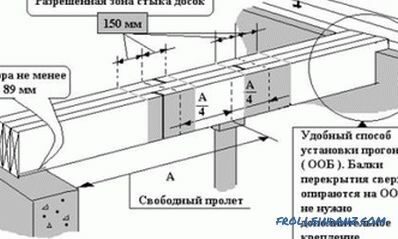 This is logical, because for its arrangement can not do without wet processes. 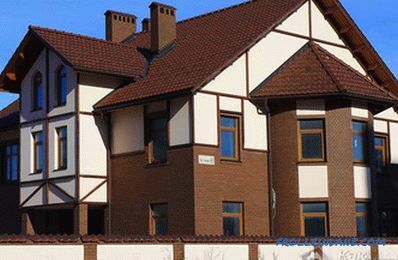 Nowadays, different compositions of plasters have been developed for facade plastering of products. 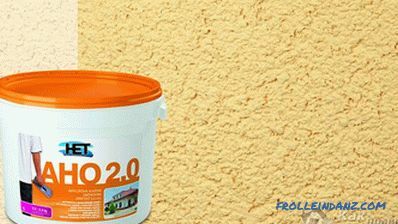 Mineral plaster. It is a sales hit due to its low cost. However, the material has the shortest operational life and low ductility. Although, on the other hand, the walls treated with mineral plaster, "breathe." It makes sense to apply a "breathable" plaster only if the walls are also constructed of materials that allow air to pass through. Mineral wool or basalt slabs can be used as insulation. 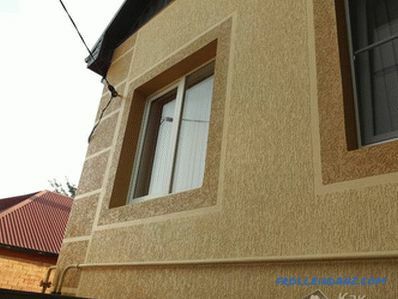 If your house is located close to railroad tracks or a busy highway, then mineral plaster for facade finishing is inappropriate in this case. The fact is that it will crack and collapse due to constant vibrations. Usually the lifetime is about 10 years. If your house has just been built, then it is not worth plastering it with this composition. The structure will shrink for several years, due to which the facade will crack and collapse. Simply put, such actions will lead to a waste of money. Acrylic plaster. The material is very plastic and resistant to moisture, "not breathing." However, if you choose foam polystyrene or foam glass as a heater, this type of plaster will be indispensable. 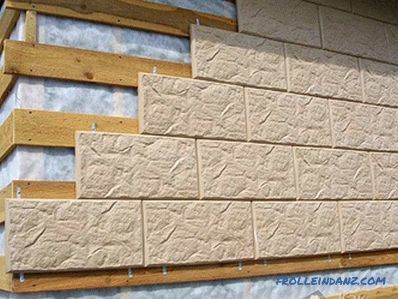 The facade withstands great vibrations.This means that if your house is located near the railway or highway, the wall covering will hold on in its original form for a very long time! Acrylic plaster absorbs dust, so if the house is located near the highway, its use to be as justified as possible. The material is very durable, and the fact that it does not “breathe” can be compensated by means of forced ventilation. The operational period is about 15-20 years. Silicate plaster. 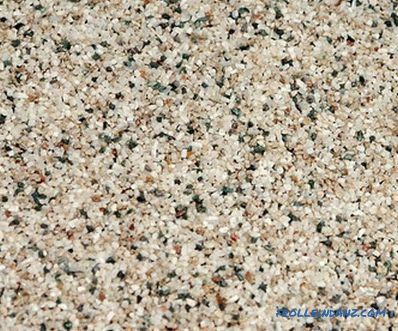 The material has incorporated all the positive characteristics. He does not collect dust on himself, is unusually plastic and lets air through, that is, he "breathes". However, silicate plaster is the most expensive. Its operational period ranges from 20 to 25 years. 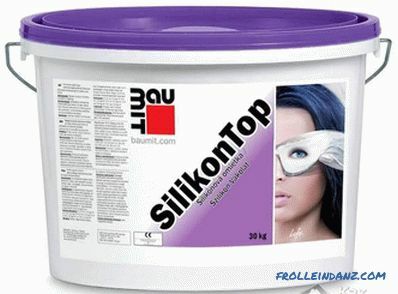 Silicone Plaster. The material is elastic, permits air, does not absorb chemical compounds, including salt, is antistatic. 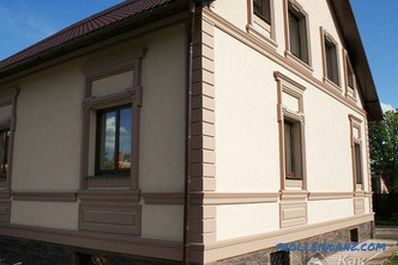 If the silicone plaster is applied correctly, then it will be a durable decoration of the facade for 25 years, or even more. The material is so reliable that they can veneer the facade, even near a busy highway. With the help of tile it is very easy to make a beautiful design of the house. However, in order for such a facade to serve for a long time, it is very important to observe the installation technology. The first thing to consider is that the walls of the brickwork should pre-shrink. 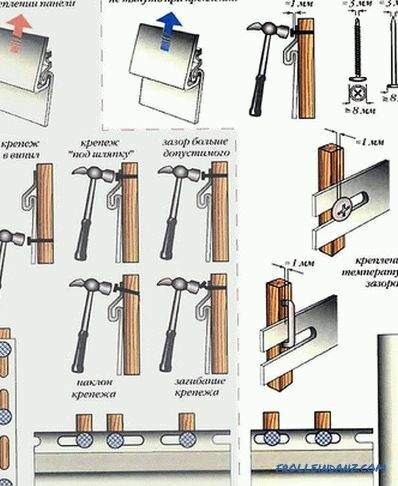 In addition, in order for the tile to hold well on the walls, for each of its appearance it is necessary to use the appropriate glue composition. 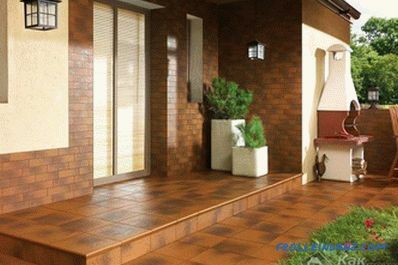 By the way, the tile is clinker, ceramic, made of natural or artificial stone, made on sand-cement base. The tile can transform a flat, unremarkable wall into an exquisite architectural masterpiece. Finishing the facade tiles is done seriously and for a long time. The tile you use must be designed for exterior work! 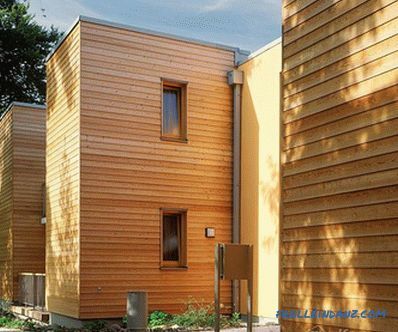 If you decide to make a ventilated facade, you can trim the walls that are insulated in this way. The method of fastening and the thickness of the skin are calculated in accordance with the upcoming loads. Ventilated facades are made of bricks. After that you can tile the walls. 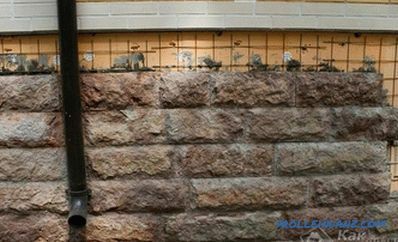 If you decide to sheathe the house with tiles that imitate chopped stone or brick, then leave spaces between the parts equal to 5 mm for subsequent grouting. To make imitation masonry more attractive, select the appropriate color grout. When combining tile textures, it is important to consider their size. To revet the base, choose large items. Smaller tiles are better for walls. Thus, the house will look more stable. The upper edge of the finish should be protected from moisture penetration. For this purpose, use protective ledges or visors. A brick is a symbol of the goodness of the structure. 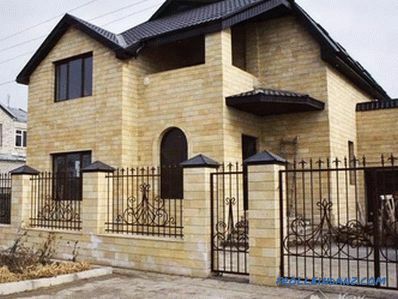 To make the house more respectable, it is best to use clinker bricks. 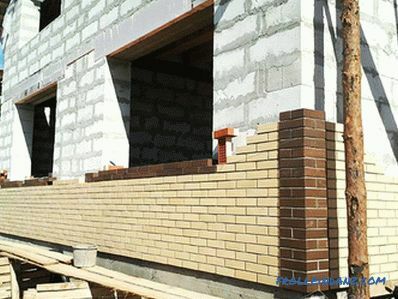 As a rule, wall cladding with brick is already done at the stage of wall laying. Such a move is usually calculated by architects in advance. How to be if the building is already built? 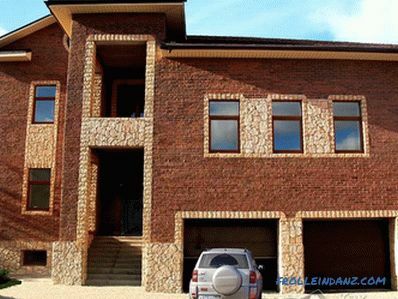 In this case, cladding the facade with clinker bricks is an ideal solution to improve the attractiveness of the house. 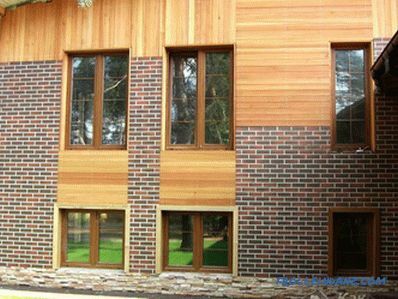 If you have a wooden house, then finishing it with brick is advisable only if installed ventilated facade. Otherwise, condensation will form on the wooden wall, quickly destroying it. 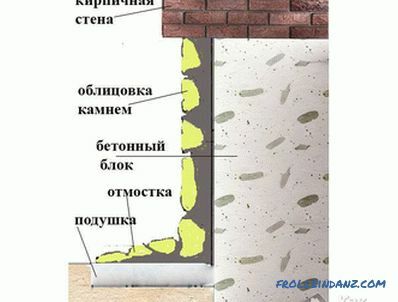 Thickening of the wall due to masonry will not increase its thermal insulation properties. 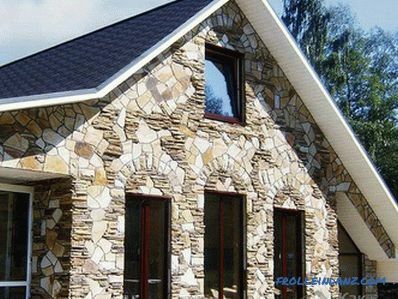 To make the house warmer, you need to make a ventilated facade with wall insulation basalt slab or mineral wool. 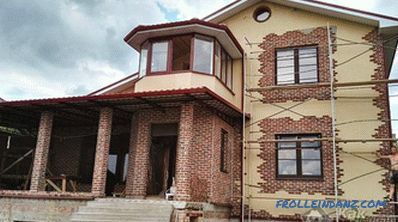 Brickwork should not be started if the foundation of the house is not reinforced and not expanded. This is due to the fact that the brick absorbs moisture. 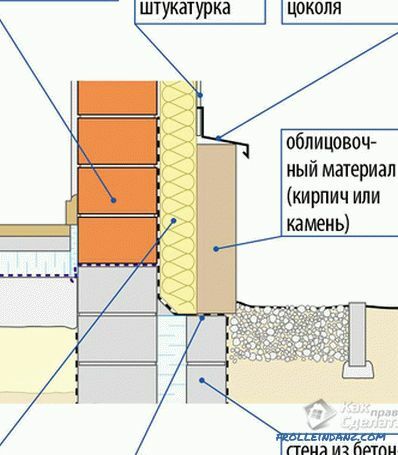 In addition, a waterproofing layer should be laid on the foundation. 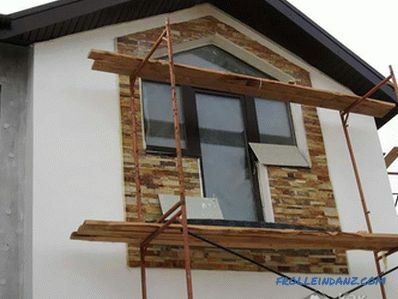 No matter what material the walls are made of, they must be connected to the masonry with flexible ties. At 1 m 2 there are 7 flexible connections. 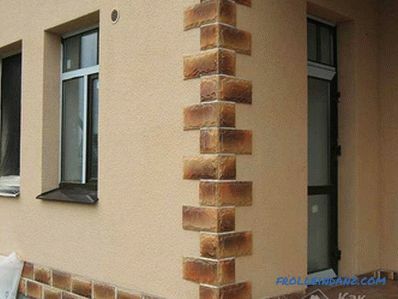 The height of the masonry together with the gable cannot exceed 7 m. Otherwise it will be fragile. To revive the texture of the wall, install decorative elements on it, such as cornices, roundings and arched moldings. In addition, you can combine bricks of several colors. 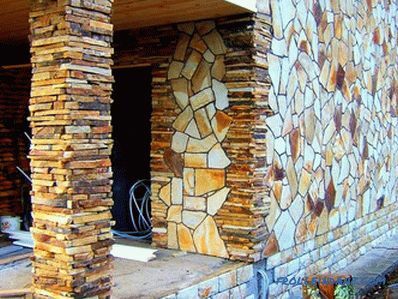 This facade will look very original and unusual.If you add the appropriate dye to the mortar, the wall will look even more elegant. 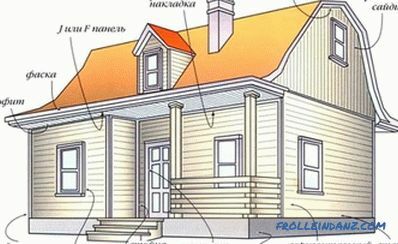 If you have already decided how to decorate the facade of the house with your own hands, then purchase the material and start the work. If you have any questions on the topic, then write your comments on the article. Working on the site experts will advise you, specifying all the details of the facade or the choice of materials. How to finish the facade with metal cassettes. 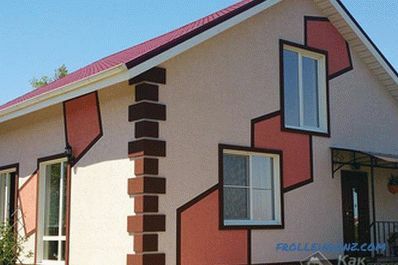 How to paint the facade of a house. How to plaster the facade. How to repair a facade.